Now it's a sink hole! 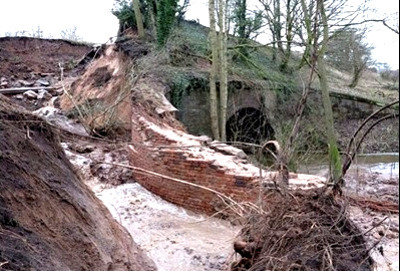 THE Breach on the Middlewich Branch of the Shropshire Union Canal is now being described as a sink hole! Which is very difficult to explain as the breach was caused by the collapse of the embankment—above ground level! "Investigations are continuing into what caused the sink hole to open up on the Shropshire Union Canal in Middlewich. The hole opened up late on Thursday night in Middlewich causing 17 million litres of water to drain out of the canal, as well as leaving boats and wildlife stranded." We need to understand what has happened and look at the evidence which has caused this to happen. We need to rebuild the embankment, reline the canal to make it water tight and rebuild the towpath."